the pillar sprite looks very nice... have you seen the pillar model from the DHMP ? For now I continue with textures. Marcelus, it does not look good, it looks GREAT! You did well with the colours, the light levels, texture, shape, light direction! Can you tell me how you made this? "Can you tell me how you made this?" first I upscaled original texture . Over this I use transparent layer and simply draw a basic shape. Then I add additional layers. Everything is done by hand. I do not use any textures from the internet and I do everything myself. I like your unfinished flat1_1 best. The cracks in the finished version are pronounced too strong, taking too much focus. I agree with deus-ex, the cracks are too strong. Good job, anyway. The new, strong cracks will become very obvious when tiled. I like the first the best, because it's subdued, colour and light correct, contrast correct, and has a nice fine gritty stone texture. The later ones are 'over processed', too eye catchy, too much contrast, this way when tiled the repeating patterns will be easily noticeable and become distracting. The high polish / shine would fit doors better because they need to attract a bit more attention, helping the player to identify them. I was wandering if you can make a new bloodfall texture, that looks equally close to the original? The current one with the simple stretch animation looks out of place to me. Maybe instead of 4 frames it could have 8 played at double speed so it's animation looks more fluid. The original Doom bloodfall is made of four images. Simply doubling the amount of frames won't work when the images are to be used as plain hires texture replacements. You would still only get to see the first four frames/images in game. For such cases the images have to be provided within a PWAD, along with a definition lump providing information for the game engine that the bloodfall now spans 8 frames. what do you think now? opinions ? The recent version resembles the source texture very accurately, great job! Yet I still like the initial version more, its representation of a worn stone floor appears more believable. The surface of the recent image, while admittedly staying close to the source image, is too smooth, looking more like the stone bed of a water stream. I agree deus-ex, though to me difference is in the small percentiles, like 1st = 99,7, the second 99,6 So ether one is great. You cannot please everyone for a 100%, therefore I suggest everyone to be very happy with this texture, and let's hope the next one is also great! I think I made it clear that I am very pleased with both versions of the texture. Wouldn't the first one exist, I'd be more than happy to use the second one without question. I just wanted to give marcelus some valuable feedback, which is very important to every creative artist. And since there are options to choose from, I made mine, yet none of these textures were made in vain. Great stuff! You latest flat1_1 looks 100% and fit's the game's atmosphere well! Have you done also the weapons???? that SSG looks great! The red cross looks a bit too bright, like a light instead of a patch put on the package. Maybe these first aid box can use a few subtle lines of sowing lines along the edges, to give them a bit more character? I'm also thinking about the box's material, this one looks like cardboard to me. Have you tried for a fine canvas? I used some weapon sprites from this pack. Do not like all objects but weapons looks nice and hell objects (dead trees) are nice... On standard shotgun is small glitch and there are som dead pixels not transparent. I fixed it but do not know If I may share but Fix is very simple. Open with some picture editor and use rubber around barrel. I did for me only aid boxes,armors (nothing good), and shotgun(pick up)... and now works for columns. Before I try more details on aid boxes but these are small in game and more details are not much visible. It would be cool if Dday had some more inbuilt filters, like it has HQ2x? Two months ago I got a new big 43"UHD 3840x2160 monitor, and I want you guys to know that the high resolution textures are appreciated even more. Hi res good looking gun models are also on my wish list now, as the low res graphics start to stand out, even through I use in engine HQ4x texture resizing. Where I believe DHTP shines is it's goal of staying true to the original colourpallete, lightlevels, contrast, shapes, mood, art style. Thank you all for your wonderful contributions. Very good, oddly enough when you start checking the remakes to the originals on an analytical level you don't notice a difference, but when you just look at them, the new ones feel far too clean, and having less depth. There's nothing to be done about it in the texture though, it's a product of the low resolution and the way your human brain works to fill in the blanks, and with the higher res textures there's enough detail you brain doesn't need to fill in the blanks; to make full use of these textures in game you would need a bump map and the engine / game supporting them. in the aspect of the texture looking way too clean, I think one can apply appropriate amounts of mud, algae, material definition, etc. The only thing I think is important is that when the new texture is resized to the old it has the same colours, contrast, shapes, attention attraction* and feel. The attention attraction means the amount of player attention the background draws from the total player attention. For instance a very chaotic and filled with colour noise bright texture would grab a lot of player attention, therefore the enemies and other stuff get overlooked. I thin king general the Doom textures are neat but modest, just sitting a step and a half below the monsters. 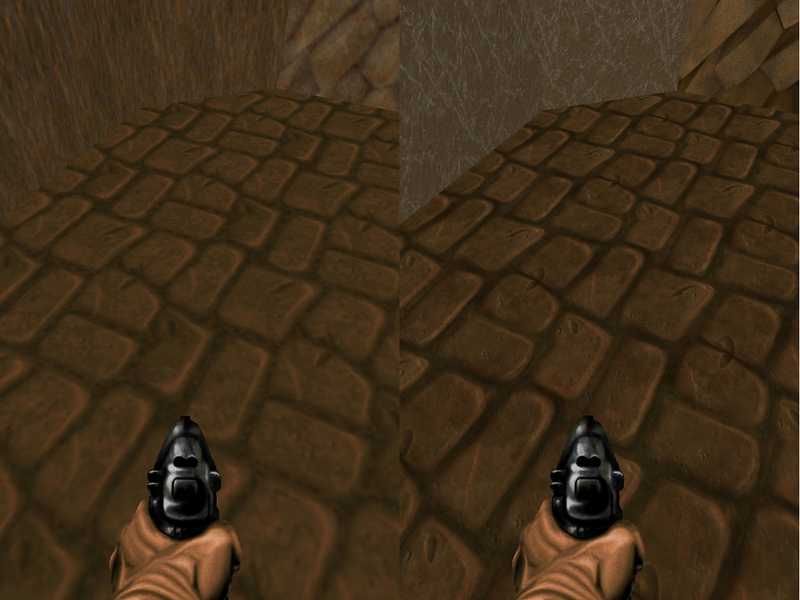 I believe the new GZDoom will support parallax mapping, and I suspect that this applied in a good and modest amount will make the textures look even better. However the monster and weapon models will start to look out of place and outdated. I'd still love to see randomization of textures, flats, sprites etc, like one can currently do with model skins.